Industry hasn’t quite settled on the usual three letter acronym for it yet, but for the sake of this piece we will use IBA – Integrated Business Architecture. 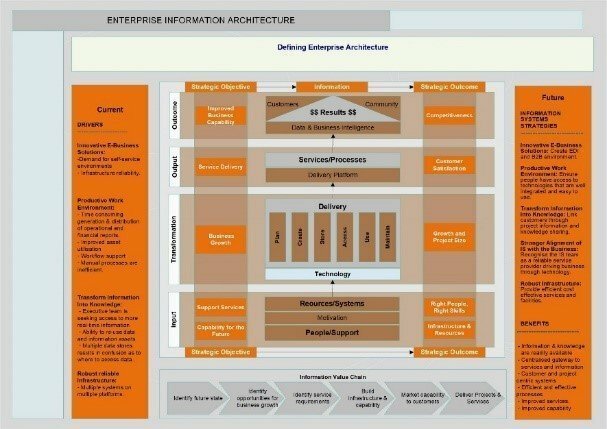 Enterprise Architecture as a discipline has been around for decades. Unfortunately enterprise architecture is typically seen as a function of ICT and often lacks executive level support. Integrated Business Architecture however is relatively new. It is a means of documenting the structure and capabilities of an organisation, the systems, information and technologies used to support it and the relationships between them. You can quickly identify the impact of any change. Having worked on numerous enterprise level initiatives, I am constantly amazed at how business performance and resilience improves through the alignment of six key elements. Add to the alignment mix an integrated, shared technology platform and you have a recipe for driving successful outcomes. Having the right IBA and alignment levers in play can take an organisation to a whole new level. Pushing and pulling the right levers at the right time helps to build resilience and capability. This means that if for whatever reason something breaks, stalls or flexes, the entire system can bounce back into shape very quickly. However, to get to that point requires a mix of art and science. The art is the colourful model below and the science is how you manage the various elements. A typical organisations business architecture has to support and enable two types of requirements, specific, and generic. Fundamentally, an IBA provides the blueprint for how business success and resiliency is designed, built and achieved. In the old enterprise architecture world (that was so last year), static models and diagrams are used to define and communicate the various architecture pillars such as technical infrastructure, applications and integration layers, information management and business architecture. They usually look something like the one below. The problem with a diagram like this is they take a long time to produce and are typically are produced as a flat image, with no easy way to put them into context, drill down into the content, or address the questions that often surface. Plus, all too frequently, people outside of the enterprise architecture discipline find these diagrams difficult to read and interpret. Integrated Business Architecture needs to be owned and maintained by the business, otherwise it tends to be skewed towards IT with all its technical jargon and flat diagrams that offer little value. Don’t get me wrong in the new IBA world the business is the driver. 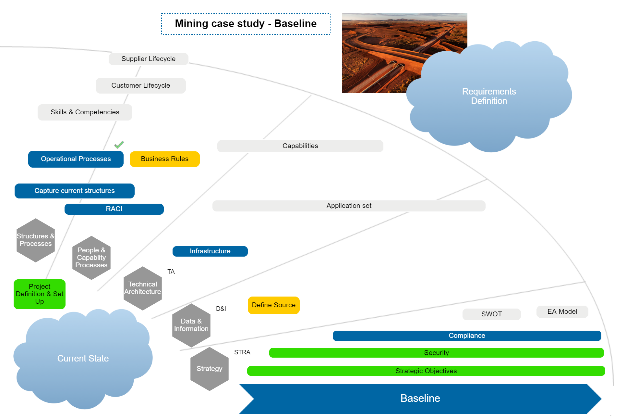 Models and diagrams are quick and easy to produce, they are meaningful, integrated, updated in real-time and accessible. Data and information are built in so you have visibility of what you have, where it is and what it costs. Having this type of information, people can be brought up to speed quickly. A great example of an integrated model, is the transformation model below. It looks reasonably simple, yet it allows people at all levels of the organisation to see the big picture from current state to future state and the various initiatives and steps in-play. You can drill down to look at the detail behind each activity or initiative, providing greater levels of understanding and insight. Performance management is made easier and more transparent. Using models and diagrams that are integrated, means that they become a useful decision support mechanism for everyone within the business. In this new IBA environment the business moves towards greater integration, transparency, continuous improvement and transformative change. 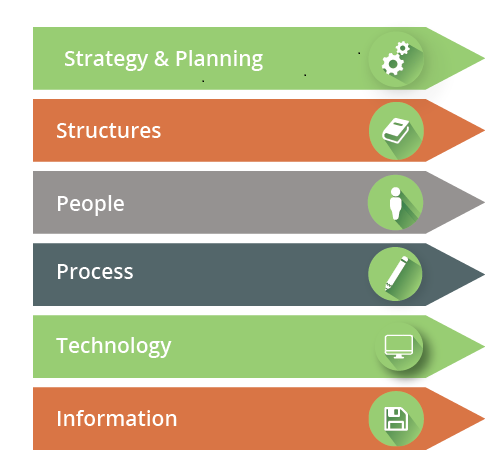 If this is what you and your organisation is aiming for contact me and I can show you how you can achieve an Integrated Business Architecture and start realising benefits from day 1.